Good News Villa has much to offer potential guests. This 4-bedroom property not only has the vast, quiet spaces that are perfect for self-reflection and quiet relaxation on holiday, but it also features amazing views of the ocean below, as well as the perfect vantage point to view the seasonal whale migration. Complete with a fitness room, a heated outdoor pool, and plenty of art to keep the most seasoned art-enthusiast occupied, this is a home that is likely to redefine the word vacation. When you are looking for the perfect outdoor spaces combined with solid indoor luxury, Good News Villa is the only place to turn. Crossing the threshold into Villa Good News will seem to you like walking into another world. In this expansive, skylit space, standing on a gleaming white marble floor and surrounded by an exceptional collection of Beaux Arts antiques, you feel as if you’ve entered the salon of a grand Park Avenue penthouse. This villa offers its guests the rare combination of beautiful furnishings, fine art, dramatic lighting, and a smart layout that comes from the loving touch of owner attention to detail and design. The large, central living area of Villa Good News provides plentiful seating for dining and entertaining, as well as an adjacent sitting room with plush sofas for relaxing in front of a movie. The adjacent kitchen is equipped for the most discerning chef, ideal for catering a large party and equally welcoming for you to prepare meals on your own. 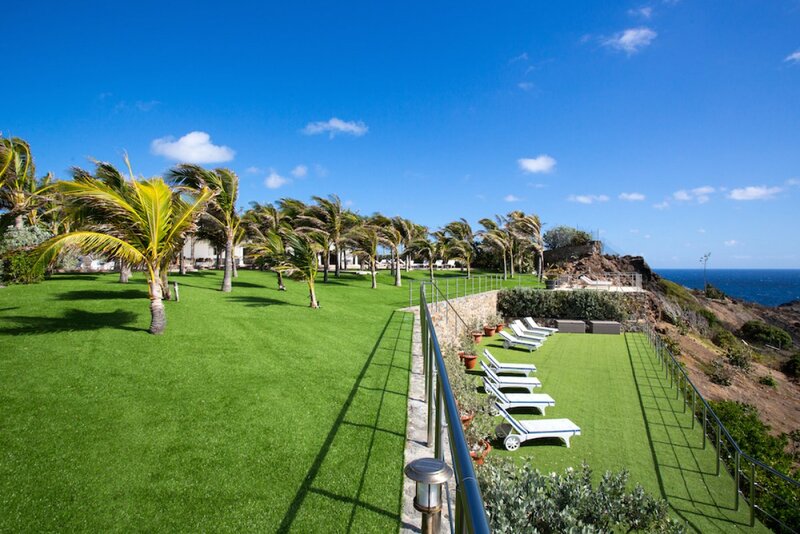 The terrace opens out onto the stunning, 180-degree vista of the Atlantic Ocean, and provides a sheltered dining area as well as a beautifully landscaped garden, with broad green lawns and rows of royal palms. The large pool is bordered with teak wood. Near the pool you will find chaises for sunning, and a lower terrace offers even more seclusion. The main living space leads conveniently to Villa Good News’ four bedrooms, two in grand master-bedroom style and two slightly smaller but equally impressive. Each one offers its own private ensuite bath, generous closet space, and thoughtful touches like rain head and horizontal-spray showers and private entrances from the outside. Exquisite antiques, headboards upholstered in fine fabrics, and crystal chandeliers add to the elegance of these special rooms. A Sonos sound system and HDTV is available in every room. A fully-equipped and air-conditioned fitness room on a lower level contains five top-of-the-line exercise machines and an HDTV and sound system. Guests of Villa Good News will enjoy added levels of luxury and service all year round, including evening turndown housekeeping, and daily continental breakfast. Butler service is included during the Holiday Season.